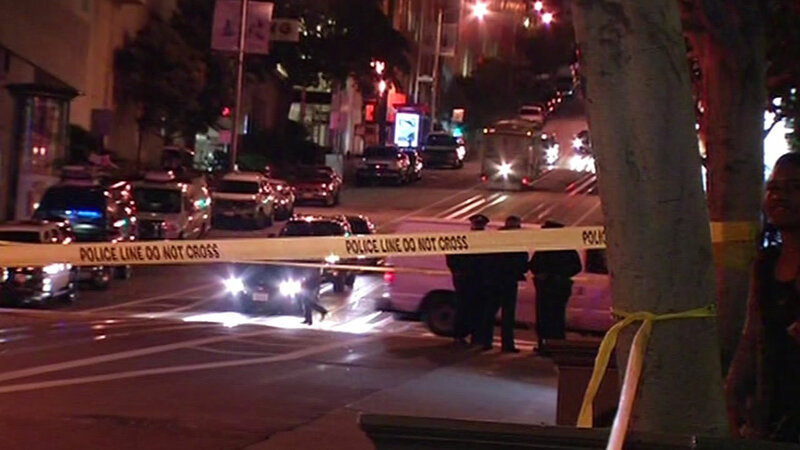 SAN FRANCISCO (KGO) -- A woman died after being hit by a robbery suspects' car during a high-speed chase in San Francisco. Friday night, armed robbery suspects were seen riding in a black, four-door sedan that was speeding downhill on California Street in the eastbound direction. Witnesses say the black sedan came in contact with a female pedestrian on California Street between Kearny and Montgomery streets. Cable car riders say the vehicle was airborne at times and it appeared that the windshield had been badly damaged. The pedestrian was transported to the hospital and later died from her injuries. A San Francisco police lieutenant told ABC7 News this vehicle is believed to be connected to several robberies that occurred over the last few days. They added that there were three men in the car and they threw out two guns during the pursuit. The driver and suspects are still at large. Police lost the vehicle as it headed towards the Sterling Street on-ramp to the Bay Bridge. UPDATE: Police initially said there were three suspects in the vehicle that hit and killed Bridget Klecker. On Monday, April 13, 2015, San Francisco Police Department Chief Greg said there were multiple suspects.